The latest set of commemorative stamps from Royal Mail should come with an extra set featuring pictures of barrels being scraped. The value structure is odd too. - 58p stamp is a surface letter to Europe. Who posts those? Its 2p cheaper than air. ..
-88p is surface letter to USA. I guess its for Christmas cards. 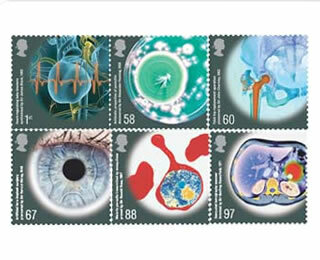 So if its for Christmas cards why is the stamp picture of the Malaria parasite? "Failed banks of the credit crunch." "Famous terrorists of the world"
and maybe a special set for Royal Mail themselves. 4. "Memorable privatisations of the 20th century" - so if you see Sid, tell him to enter. As someone who has spent a fortune supporting their daughter get a Phd studying medical science - and breakthroughs, I'd just like to say there are too few scientists in the UK as a)they're not paid enough and b)they're not valued. The result is they leave the UK so that the bankers can create the wealth we need in this country! "NCP Car parks of Birmingham"
"Latin teachers of Eton 1887-1925"
"Reward and loyalty cards of the supermarkets"
Anon: The complaint is not against medicine or scientists. The complaint is having a hip replacement as a stamp. Commemorative or special issue stamps are purely a revenue generator from Royal Mail. They frequently feature pioneers of their fields. But usually it is a portrait of the individual. Featuring their work is a less popular stamp, but is frequently covered. The problem is these stamps are designed be to the set that will arrive on the December doormats of Australia. They are for the organised people who know there are only a few weeks left for surface mail. Who is going to rush to buy a "Merry Christmas" stamp to send to a loved one with a picture of a CAT scanner on it? How about a set commemorating Bad Days for the Post Office? 1. The first telegraph machine. 3. The split of the GPO. 4. The first Fax machine. The Bruce Forsyth centenary collection must be due soon each featuring a different catchphrase. Public schools: tie plus sample Prime Minister. Nuclear disasters: Sellafield, 3 mile, Chernobyl. This could be the first "glow in the dark" edition. The Noel Edmunds collection? Start with "swap shop" 1p and then have decreasing values. A classic set for philatelists. How about great pieces of union reform? A stamp to commemorate the death of flying pickets would be a sight to behold.